i.e. where do you live and why, for how long? Where did your family come from and when/ where did they emigrate to? My grandparents are from Collefracido and Sant’Andrea, both near L’Aquila, Abruzzo. My father and his brothers spent their summers there as children (they grew up in Rome). I grew up in America but visited my great aunts there every summer until they passed away. In my family, we were taught that Abruzzo was the heart of Italy. “Forte e Gentile” (Strong and kind). The food and lifestyle, but mostly the people, represent this axiom best. Though it’s often known for its simplicity, Abruzzo is a large and diverse region. It’s also relatively free from hoards of tourists. If I say too much maybe that won’t be true for much longer. It’s far away from Los Angeles. The food and its architecture — both overshadowed by its more famous neighbours, but truly remarkable. I think people are usually surprised at how splendid the churches and piazzas are, and beyond that, there are truly incredible ruins and towns embedded in the mountains. Some are reminiscent of the Hopi dwellings in the American South West, and yet are only a drive from the vibrant towns and cities. It’s truly unique. In Sant’Andrea on Vico Vannicelli, where my great-grandfather’s house overlooks a fig orchard. Any urban center, whether in Pescara or L’Aquila — I have enough of that in my life already. Spending time in nature, walking until your feet are sore, cooking yourself a delicious meal with some delicious wine, and then looking up at the stars. The silence is restorative. Any table wine you can buy in a jug without a label. Where’s the best place to eat? What would you do for a special occasion? Every town has its own wonderful place to eat. In Pescara, as the name implies, the freshness of the seafood is truly incredible — and still available for a good price. It’s vastly overlooked on the culinary map of Italy. Is it cheating to say my grandmother’s ravioli? Her cooking was heavier than much of what I eat with my family in Rome, but everything was made from scratch and kept me growing as a boy. I would give anything to eat some of it right now. Walking — I’m worried I’m going to repeat myself on this… I’m not much of a skier, but I know those who are won’t be disappointed. The Maiella mountainside is incredible, but so are the small towns and the larger towns. It may require a drive to go between the towns, but they are best seen on foot. Collefracido, though I’m biased. This is the town where my grandmother was born and lived until she married my grandfather, who was from the nearby town of Sant’Andrea. Half of the town still has her name. She raised her children in Rome but never truly left — as much as they could afford to, they would spend summers and holidays in her family home. The Spiritual Trail in the Maiella mountainside. Learn Italian and be courteous. Wandering. There is a sense of freedom in Abruzzo that is incredibly rare and is best appreciated without a strict itinerary. This may not be the most exciting answer, but D’Annunzio is worth reading, whether or not one is interested in Abruzzo, but especially if they are. It captures the essence of something profound and makes the words I’m writing seem awfully clunky… Better to just read him! I’m named after my great-grandfather who is famous for saying, “Tutto in moderation” (everything in moderation). Abruzzo is an incredibly rich place, but those riches aren’t flashy or hollow. I try to remind myself of that daily (I live in Los Angeles). 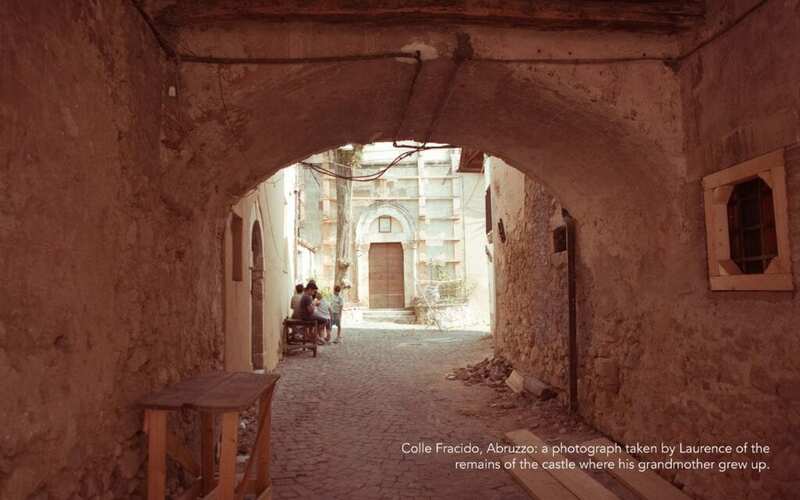 What can you discover about yourself if you get off the beaten track in Abruzzo? This is a difficult question since it’s different for everyone. For me, my roots are here, so exploring and discovering has been a profound experience in my life. It’s hard to see the region through the eyes of people without that connection, but I would imagine that its rare combination of nature, history and its people would mean something to everyone. There is a profound simplicity that exists in Abruzzo (not that it means the people or its culture are simple) that is incredibly compelling. I have two items from the small castle my grandmother grew up in that destroyed during the earthquake: a piece of the roof and a sheet of prominent figures from Italian history (Cicero, D’Annunzio, etc) from an old school book. I keep them above my desk to remind me what matters in life and how grateful I am for my lineage. I am also in pre-production on a feature-length film set in Abruzzo. It is very much about the history I have with the region and will be a low-budget and very creative comedy that highlights Abruzzo itself. It will be a challenge to capture what makes Abruzzo what it is — its soul and character — but if I can successfully I know there is nowhere else I would rather shoot. The uniqueness of its locations and its spirit are truly inspiring. Laurence Vannicelli is a dual citizen of the United States and, Italy. 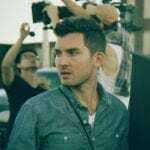 He graduated from Brown University (‘05) with a degree in Art-Semiotics and Columbia University (’15) with an MFA in Film, where he won multiple awards for his writing and directing, including the David Jones Memorial Award for most promising director. His short film, The Young Housefly, was nominated for a Student Academy Award and his feature script, Station Blackout, won the Sloan Screenwriting Award and is now in development. He lives in Los Angeles where he writes action movies. Laurence has just completed post production on his first feature film, Vera. To learn more visit www.laurencevannicelli.com. Dear Friends, in the next days there will be amazing news about our film project. In the meantime we want to thank you all for your interest and attention, and remind you that our kickstarter is in the final days, and we still need help and support to make our film real. Yes. I want to live there. My mind lives there. Yes!!! That is why I bought my tiny condo there!!!! There are a lot of Abruzzese in Australia as well. That’s a real shame we live in nsw in Aus, there were a lot of families from Abruzzo living here in our city. My husbands family were from Celano in Abruzzo. Dear Friends! We are really happy that our project, about the relationship of a second-generation Abruzzo-American with his father and his ancestry, stimulates so much interest in all of you. We want to keep in touch with each of you as much as possible, answering your questions about our film. Soooo, feel free to contact us! We will answer as soon as possible. And please, Help our project! Our Kickstarter needs to be shared and to reach as much backers as possible! Still 15 days to go! Yes it does! I fell in love with Abruzzo the first morning I awoke and looked out my Nona’s bedroom window to see green fields and orange poppies in a foreground with dark green mountains behind and blue skies above. I was 14 and we were visiting for the first time from the US. It was magical then and still is today. My mother was from Peterrano Sul Gizio. My paternal Grandfsther was from Molise Nd paternal grandmother from Scanna. An indie film in Abruzzo! Must support. Yes, I think it does. I could easily live there. My grandparents were from Castiglione a Casauriai.. We always celebrated our heritage. I have been too Abruzzo 3 times in my life and cannot wait to go back. The people, towns, customs and food are the best of Italy. My grandparents were born in Taranta Di Peligna. I would live in Abruzzo if I could. Halloooo… feel free to contact us, we are very happy to know all of you! I’m so happy to read this as I’m second generation. My paternal grandfather, Guiseppe DiLuigi was from Abruzzo and immigrated to Philadelphia, PA where my father was born. I’ve always felt such a connection to my Italian heritage, even tho I never met my grandfather (he died when my dad was a boy), and only met Nona once! But I’m going in June to visit Italy (and EU) for the first time! I’m going to Rome, Tuscany, Florence, and Abruzzo! I can’t wait. It all looks so beautiful. I hope to see your film! Good luck and God bless. Hallo Renee! I’m Ruggero, one of the producers of La Certa. Thank you very much for your interest. If you need some tips for your trip, feel free to contact me. I lived in Rome and L’Aquila, and I know also Florence pretty well. 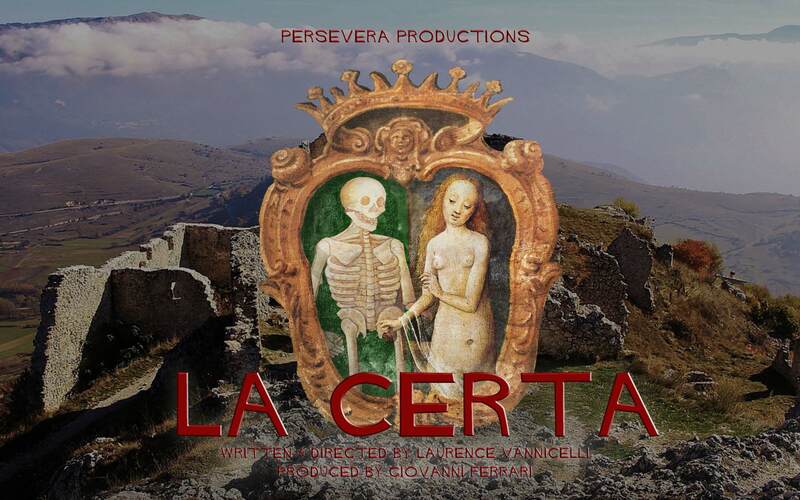 If you want to support our film, you can donate at this link: https://www.kickstarter.com/projects/151166450/la-certa-a-feature-film . Each help, little or big, is more than welcome. And please, share it with as much people as possible! Thank you very much for your interest in our project! As Humphrey Bogart says at the end of Casablanca, we hope that this is the beginning of a beautiful friendship! My father was born in Paganica vicino L’Aquila. Still have a uncle and cousins there. Been there four times. My whole 44 years living in Michigan I lived Abruzzo every day. My moms parents were born in Sicily but the Abruzzi side was a lot stronger.